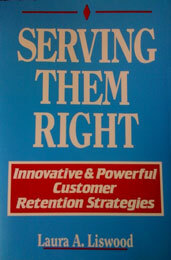 Serving Them Right examines the most persistent and longstanding barriers to quality and good customer service in American business. Liswood studies distinct tactics and techniques for improving service delivery and raising customer satisfaction levels. She outlines the nuts and bolts of service-delivery management and the ongoing commitment needed to sustain an effective program once it is in place. Laura Liswood provides practical advice to management at all levels of an organization to restore quality and service in American business. She discusses cutting-edge ideas such as the need for a chief service officer, a complete realignment of complaint-handling by top management, and a new set of service measurement standards.